studio My.comB.V., where we are waiting for an exciting space adventure with elements of action. The game will please us with non-trivial gameplay, original design, high-quality graphic design in a cartoon version, excellent animation and quite decent sound. Looking at the screenshots, it may seem that in front of us is the usual scrolling shooter in which you need to deal with the armadas of space pirates and there is some truth in this. 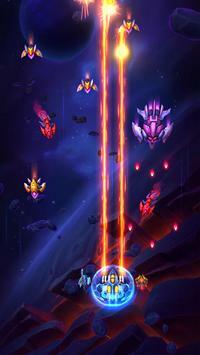 However, the main task is to protect your giant spaceship from enemy raids and constantly improve it. 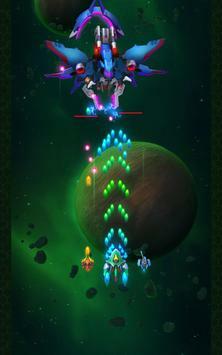 The first sorties resemble a space shooter broken into levels, but after a whil,e the training mode throws us into an online battle. There we have to break the space base of aliens or just members of a different race and what is happening reminds of a showdown with the boss, but this is not quite so. Only much later we are given to understand that we also have such a base with a nuclear reactor, a captain’s bridge, generator compartments and protective decks, one of which already has several turrets. In general, in fact, the game has two modes. The storyline provides an opportunity to fight with bots, earn stars (oh, and this is not an easy task), get magical cases with experience and puzzles that are required for pumping weapons and the main ship, as well as buying new drones and attack aircraft. The online battle gives us the opportunity to test our own strength in order to penetrate the protection of a random opponent and test our own ship, which is also an aircraft carrier. It is worth noting that the development of the database is directly dependent on the passage of story missions. For example, the opportunity to buy an additional drone and improve the ship’s reactor appears only after passing through the ninth location. And to upgrade everything and everything, not only gold, but also experience is required. In general, the availability of funds does not guarantee the ability to spend them and this makes the gameplay even more interesting. Space Justice for Android is an interesting scrolling shooter with strategy elements, after which you can spend a lot of free time. The game is distributed free of charge and does not bother with advertising, and the existing donat system is completely loyal.